This is my second team build guide and I’m going to share the best lineup for Sasuke [Susano’o]. This guide will be for the Pay to Win (P2W) players as it is hard for Free to Play players to acquire Sasuke. I have to agree so many people consider Sasuke [Susano’o] to be outdated and there are other ninjas way better than him. However, you can still dominate your battles if you use him right. 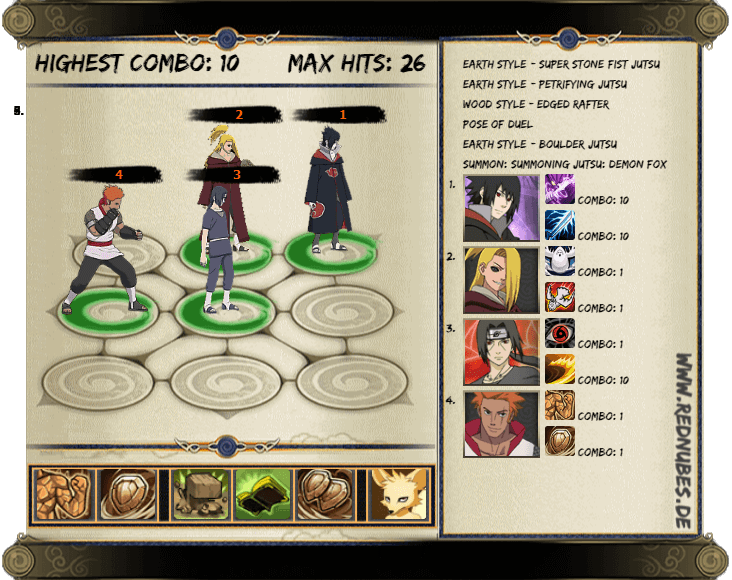 This guide is catered for P2W players as it requires huge amount of ingots to acquire Sasuke. As I’ve mentioned earlier this is a P2W lineup and well-suited for players who are spending on ingots. The mystery of the Breeze Dancer will help you getting rid of all the buffs and shields of the opponent team. There is a good team coordination with Darui and Nagato. As Darui will create barrier in the first round itself, it will give good boost for Sasuke. Moreover, Darui’s mystery is extremely helpful in Team Instances and Great Ninja War Battle. 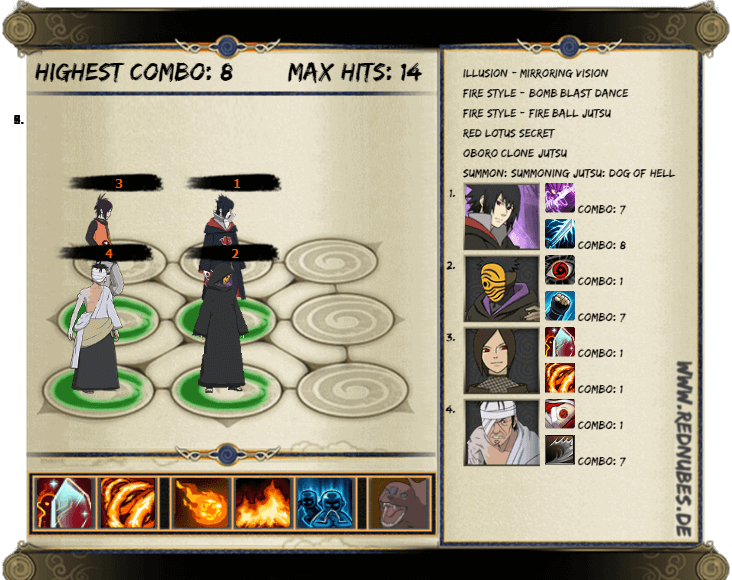 With this team you’ll be able to make maximum 11 combos and maximum 26 hits. After Naruto Online was updated to 4.0, this Fire Main lineup meta seems to work pretty well. 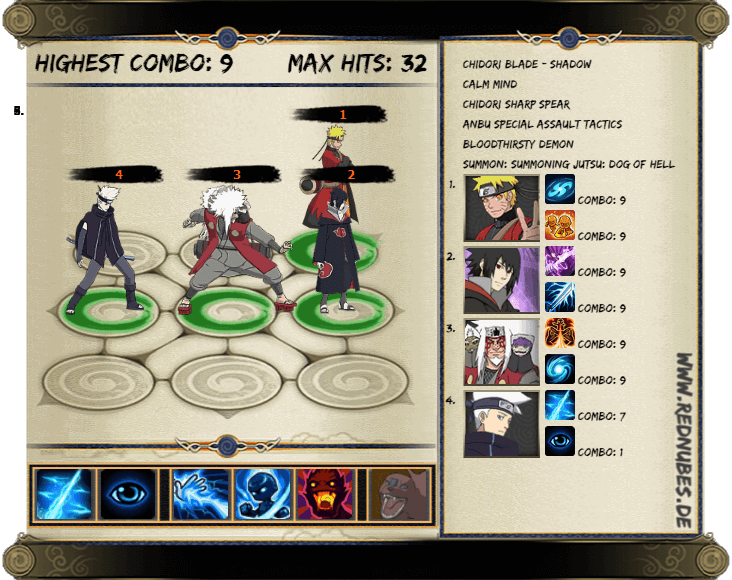 The mystery skill of the Fire main will remove all debuffs of ninjas and provide one round debuffs immunity. As Masked Man can immobile and remove buff, he is a great addition to the team. Although the overall buff for the whole team is not so great, it is decent enough to match top tier teams in the game. If you don’t have Danzo, you can either replace him with Iruka or Kurenai (Skill broken). This lineup is heavily P2W but getting Sasuke Susano’o itself requires you to spend lot. It is a easy to manage lineup. 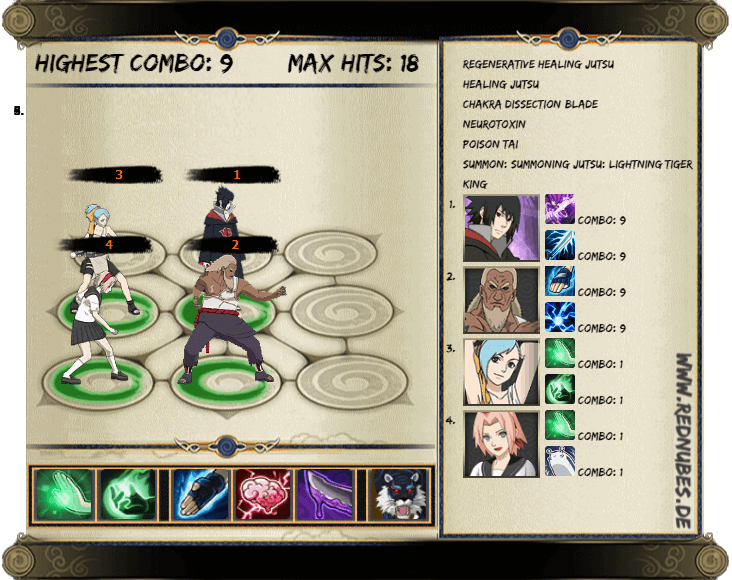 You just need to use your Fire Main mystery in the first round to shield up your ninjas and than followed up by Sasuke’s mystery which provides the highest combo(take a look at the screenshot above) lastly use 3rd Raikage’s Mystery. It should be a pretty easy win with this lineup. Naruto [Sage Mode] can provide huge sustainability for the team. As Sasuke and Naruto in the front-line it would be a great defense Lineup. 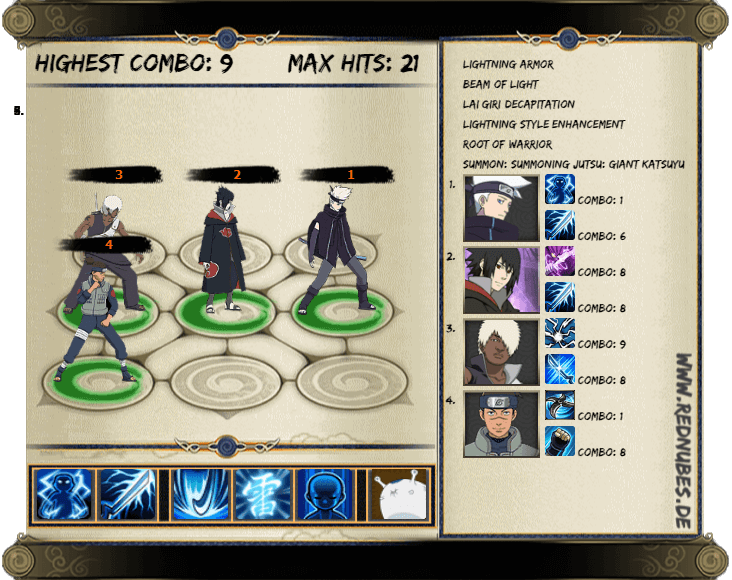 The main aim to use Calm Mind for Lightning Main is to stack up Chakra along with Naruto and Jiraiya Ability to allow the mystery use each round with almost 80 chakra every single round. This lineup will be ideal if you’re facing high combo team. This lineup will provide great deal of shield and buff for the team especially for Sasuke and Lightning main who will be doing the most damage. However there is a flaw in this team. If you’re against a team with immobilizing ninja, it will be a great threat towards your Lightning main as the huge damage dealing will be stopped. Just be careful with the team you’re up against. 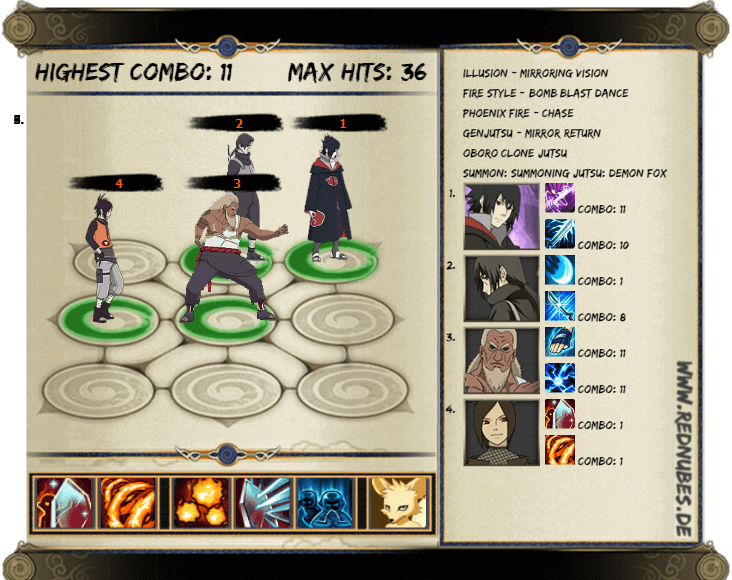 The Earth Main will provide great amount of shield addition to the Taijutsu combo immunity of Sasuke and Itachi. You just need to make sure you opponent does not target your Deidara or Earth Main. This is a super hard team to get as you can see how much you need to spend for all the ninjas. If you made it, this will be an awesome team to dominate with. 3rd Raikage and Sasuke Susano’o are immune to taijutsu combos. When both of them can be tanky AF with two healers backing them up and removing Debuffs. This team will be super pricey as you will need to puchase Sailor Sakura on top of getting 3rd Raikage and Sasuke Susano’o. If you manage to get this team, you can annoy others to keep getting healed and make huge damage with the addition of Water Main’s Neurotoxin skills. 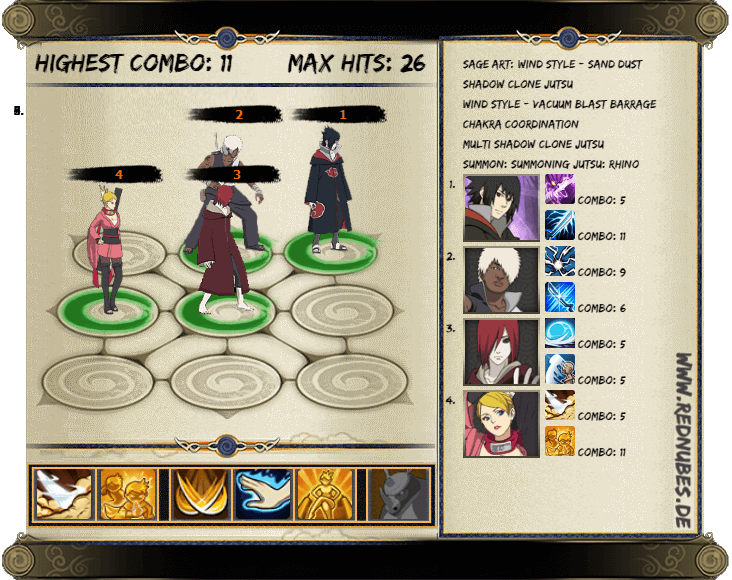 What do you think of these Sasuke [Susano’o] lineups? Do you have any other lineups in mind? Please do share them with us by commenting below.